Attending a grand wedding can be quite a stressful event, with pressure setting in from the moment you start gift shopping. If you find yourself in this situation, first ask yourself what the groom and bride love to do: If they live fashionably, are digital media icons, or lead a jet-setting life, we’ve got the relevant goods that are applicable to their sophisticated day-to-day routine. Be a wizard of surprise thanks to this compilation of 30 gift ideas of lavish mores, that will mean a lot to brides and grooms who’ve got everything their heart desires. Two greats combine, in this headset and mini backpack edition that make on-the-go home audio possible. This iron blue advanced purifier eliminates up to 99.95% indoor gases and particles, while looking super fine. Function, style and versatility is in this smartwatch of cutting-edge technology, also winning the groom's approval for its traditional watch-making values, too. With its compact and unique form, the sleek camera is the perfect gadget to capture moments of married life and beyond. With its ability to seat up to seven passengers, this sporty family car is a not-so-subtle hint to kickstart family life. Rain blessings on the couple, with an auspicious Prosperity-themed, Chinese glasswork masterpiece to brighten table tops. With the ability to store up to 9 liters, this collector's item is the largest of its kind, a ceremonial gift idea, molded by over 20 master crystal-craftsmen and an award-winning master sculptor. If the groom (or bride, too) loves coffee with milk, this nifty machine boasts a one-touch milk system that creates full-bodied cappuccino, latte or espressos in minutes. This designer ice-white punching bag will easily shave off hours at the gym, and keep the groom at home and closer to his wife. One of many byproducts from a momentous partnership between Royal selangor and Victoria & Albert Museum, this special flask is a tribute to the Deco movement and influences of textile designer Marion Dorn. Give a man the right pair of shoes, and he can conquer the world. With its water, grime and dirt-proof resistance, this Samsung phone encourages the masculine instincts to go forth and pick his adventures. Indulge the game-loving, movie geek in a man with this hi-definition TV screen, a razor thin beauty for those Netflix-and-chill nights in. This manly fragrance is a whiff of Italian summer, with stirring notes of bergamot, juniper berry and cedarwood oils. Encourage the groom to pick up some DJ-ing skills that would come in handy for future house parties. Buying a car together is every couple's important milestone, best commemorated with this customised-message red leather tag. Mark every second of her marriage with this passionate timepiece, made from prized detail like mother-of-pearl, 19 diamonds and four brilliant cut rubies. Get literal with your love anecdotes -- gift the lady this adorable statement pair of slingback heels in chic ivory and red suede to commemorate her dream day. Hidden messages will never get old -- this keepsake necklace lets you engrave a personalised love note within a rose golf pendant. A seductive scent of Turkish delight mixed with rose produces this exotic, oriental treat, guaranteed to soothe frayed nerves. What better way to embark on a new journey, than with a diary-journal to pen down all the memories and grand plans of the year? With its glossy, durable glass body, advanced camera and wireless charging, it's safe to say this is on every bride's wish list. A luxurious bouquet is captured in this voluptuous bottle of sensual notes that makes for a memorable wedding day scent, think Jasmine Grandiflorum, May Rose, and Tahitian vanilla. Flashy, vibrant, and expressive, this metallic gold leather handbag swathed in stars and hearts will strike a chord in every newlywed lady. Dainty and shimmering, this pair of clustered, classic white stones with little red hearts will remain an evergreen jewellery box favourite. Mark their union with an heirloom present, preferably this aptly-named Aphrodite exclusive collection featuring the delicate beauty of roses. Give the bride the radiance boost she needs for her big day -- this portable kit nourishes skin overnight for an energised glow, the morning after. 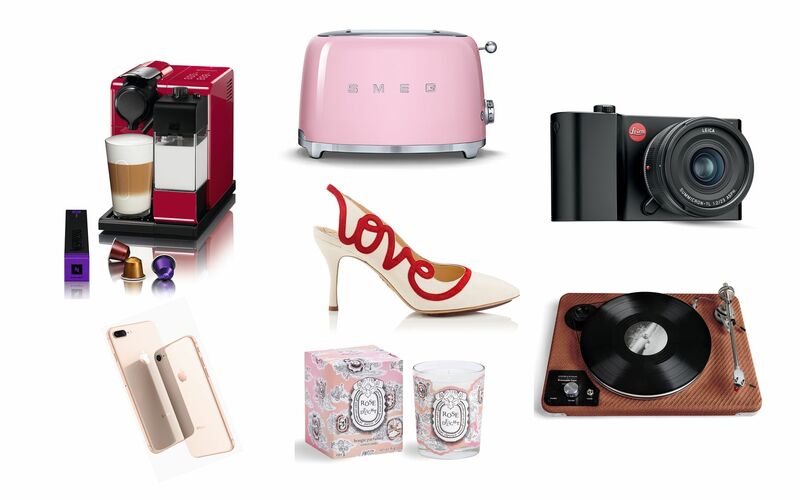 Add luxe and pure femininity into the everyday appliance, such as the pleasing sight of this cotton candy pink toaster. This 18-carat rose gold ring features 2 contrasting hearts; the larger set with diamonds, and the smaller; a single diamond, a twinkling thing of irresistable beauty. The love potion to a tea devotee's heart, this fragrant blend of black tea features yellow blossoms and quince notes, reputedly a sacred fruit of Aphrodite.